The Vaka Taumako Project is trying to perserve a way of life. Located in Taumako, a village in the eastern Solomon Islands in the South Pacific Ocean, this community is arguably the last in the world to keep the traditional wayfinding and open ocean voyaging canoe tradition alive. They have launched an Indigogo with the help of an anthropologist to build another canoe and keep their knowledge alive. The vessel in the video is a traditional vaka, a voyaging canoe built by hand using only sustainable local natural materials. Using precise navigational skills based on a comprehensive system of wind, waves and stars, these vaka are sailed for great distances without the use of any modern technology. The maritime knowledge of Taumako Polynesians is quite possibly the only fully authentic Polynesian voyaging tradition still alive in the entire Pacific Island community, according to their Indigogo web page. On December 24, 1968, Apollo 8 astronauts Frank Borman, James Lovell, and William Anders were coming around from the far side of the Moon on their fourth orbit. He snapped a black and white photo (top), capturing humanity’s first view of Earth from another planetary body. A few minutes later, Anders put color film in the camera and took the iconic color photographs of a half Earth hanging over the lunar horizon. While the astronauts were absorbed in this view of home, a second camera mounted to the front-facing window continued to photograph the Moon every 20 seconds on an automatic timer. By matching that series of photographs to a high resolution model of the lunar terrain as observed by the Lunar Reconnaissance Orbiter (LRO), NASA scientists and visualizers have now identified exactly when the Apollo spacecraft turned and where and when each Earthrise photograph was taken. This allowed them to re-create the Earthrise experience in a new video (above). 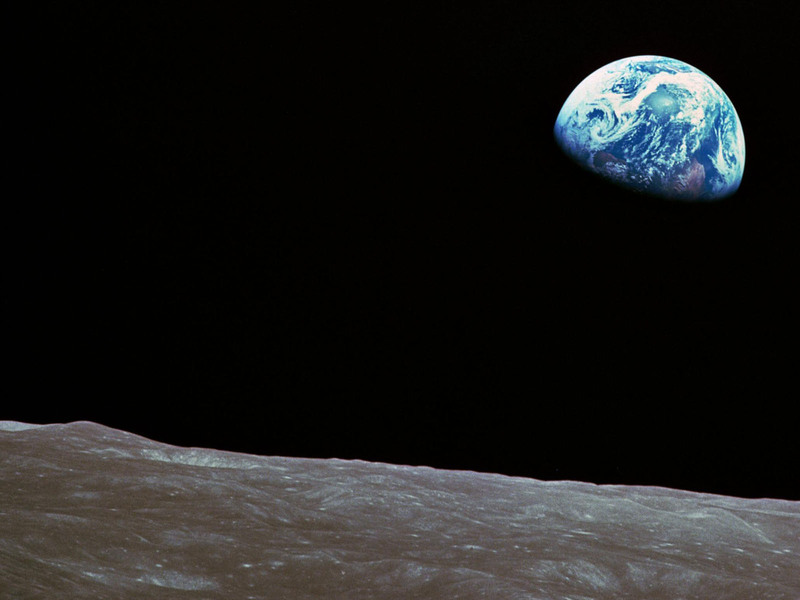 The second image above is a still from that re-created Earthrise. The surface of the Moon is based on LRO data. The land surface is based on the Earth Observatory’s Terra MODIS Blue Marble. This high-fidelity re-creation shows the rising Earth as it must have looked to Anders, Borman, and Lovell 45 years ago. The western coast of Africa is visible along the lower part of the globe, with Antarctica in the upper left and South America along the top. The new analysis revealed a few little-known details about the circumstances in which the photos were taken. Earthrise had occurred on each of the previous three orbits, but none of Apollo’s windows were looking that way. It was only during and after the roll that the event was visible to the astronauts on their fourth orbit. Experience Earthrise by watching the new video below, with views matched to the onboard flight recording of the astronauts and additional narration by Andrew Chaikin. Then watch the Google Hangout with Chaikin, LRO project scientist John Keller, and producer/visualizer Ernie Wright, in which they discuss how the video was made and what new insights it provides. NASA (2004) Apollo flight journal. Accessed December 20, 2013. NASA (2013, December 20) NASA releases new Earthrise simulation video. Accessed December 20, 2013. NASA Goddard (2013, December 20) NASA’s LRO Earthrise 45th anniversary hangout. Accessed December 20, 2013. NASA’s Scientific Visualization Studio (2013, December 20) Earthrise: The 45th anniversary. Accessed December 20, 2013. NASA Apollo 8 photo by Bill Anders, data visualization courtesy Ernie Wright, NASA Scientific Visualization Studio. Caption by Holli Riebeek. Mark Richards says he has never felt afraid in the Sydney to Hobart yacht race in which he has won line honours on Wild Oats XI as her skipper six times, but does he get nervous? Such is the fine line between embracing the dangers of the 628-nautical-mile Bluewater Classic, or letting them get the better of you. However, for Richards and most skippers, if not all their crews in the 94-strong fleet in this year's 69th edition, the nerves are not just triggered by rough and tumble conditions at sea. 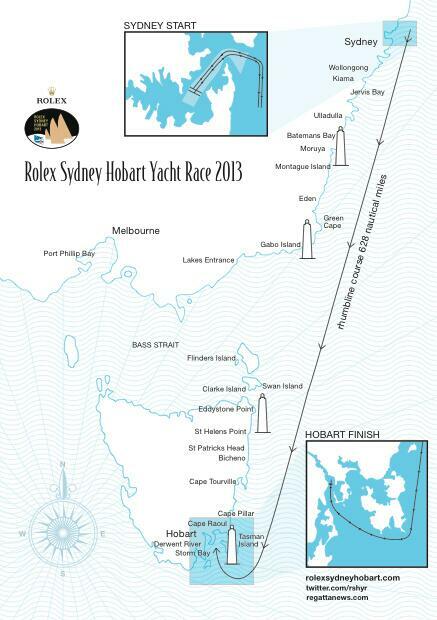 The nerves will be rattling in the pits of their stomachs well before they sail out of Sydney Harbour and head south. For many, the anxiety will have kicked in the night before; but if not, it will on Boxing Day morning when they realise the comfort they felt in their bed was the last they will enjoy for two to six days, depending on the type and size of their boat. And there is no shortage of variety this year in the fleet that will be vying for the Tattersall's Cup for first on corrected time - or on handicap - and the J.H. Illingworth Trophy for line honours. Included are four racing maxis - Wild Oats XI, Perpetual Loyal, Wild Thing and Ragamuffin, the fancied Botin 80 Beau Geste, two Volvo 70s in Black Jack and Giacomo, 12 Clipper Round the World Race 70 footers , a bevy of middle-range boats such as the new 60-foot Ichi Ban and performing 55-footer Wedgetail, a host of 40 and 38-footers and the two smallest yachts at 34 feet, Wilparina and Illusion. 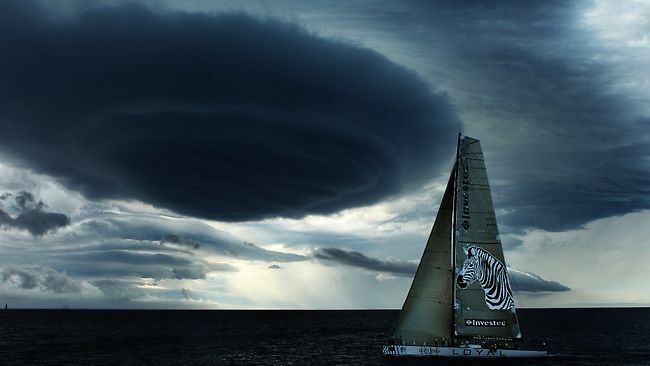 Add to that the pressure brought on from the uncertainty of speculative forecasts that Richards and line honours rival, Perpetual Loyal owner and skipper Anthony Bell, have downplayed believing that what really matters are the conditions on the day. Bell, 38, who has raced three Hobarts and beat Wild Oats XI for line honours in 2011 on his old boat Investec Loyal, says even the latest forecast on race day can be wrong. ''Go back to Big Boat Race day and we only left the dock an hour before the gun and we were told it is going to be six to eight knots and it was 26 - and that's in Sydney Harbour,'' he said. ''There is a lot of talk about the forecast and you can get weighed down in that. For Adrienne Cahalan, who was Wild Oats XI's long-time navigator but has not been selected this year, her 22nd Hobart race on Bill Wild's handicap honours contender Wedgetail, offers a new challenge. ''The forecast which is so uncertain is really going to put a lot of pressure on a lot of teams … how people handle that pressure and how they work out the strategy and keep calm,'' she said. 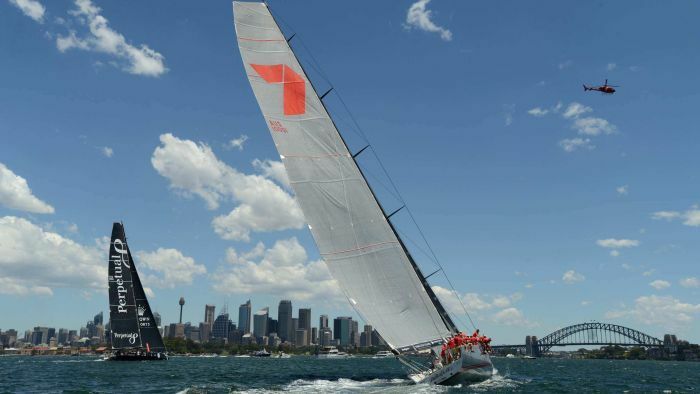 Cahalan predicts a close fight between Wild Oats XI and Perpetual Loyal for line honours, but won't rule out Syd Fischer's Ragamuffin, nor the Volvo 70s of which her reference reminds her of 2001 when a line honours victory slipped by. Cahalan crewed on the 80-foot Nicorette that took back the lead on her last day after being hit by a water spout on the first night. But when winds abated, Nicorette became parked in Storm Bay where the Volvo 60 Assa Abloy steered out to sea after seeing Nicorette to take line honours by minutes. ''There are just enough pot-holes in this race that that could happen again,'' she said. Wild Oats: Built in 2005 for immediate success and now owner of six line honours wins in this race along with two overall victories. Race record holder. History says she is the one to beat. Her crew includes the likes of skipper Mark Richards and America's Cup skipper Iain Murray. Perpetual Loyal: The rebuilt speed boat when named Rambler lost her keel and capsized in the 2011 Fastnet race in UK. Unproven here except in a short harbour race where she was actually ahead of Wild Oats when a sail exploded. Big and powerful and looks the boat to beat in reaching condition. Crew includes round the world sailor Jessica Watson with her skipper Anthony Bell. Ragamuffin: Won two years ago as Investec Loyal and under the guidance of veteran Syd Fischer. Done more racing than her rivals this year and has had water ballast installed to increase her downwind speed. A danger boat more than capable of bumping her rivals from the spotlight. Her crew includes round the world racers and well-known Sydney helmsman and 18-foot skiff skipper David Witt. Wild Thing: The lightest of the supermaxis and fast in running conditions. More than capable of an upset if her conditions prevail. Skipper Grant Wharington has won with her before. But the boat has a chequered past. 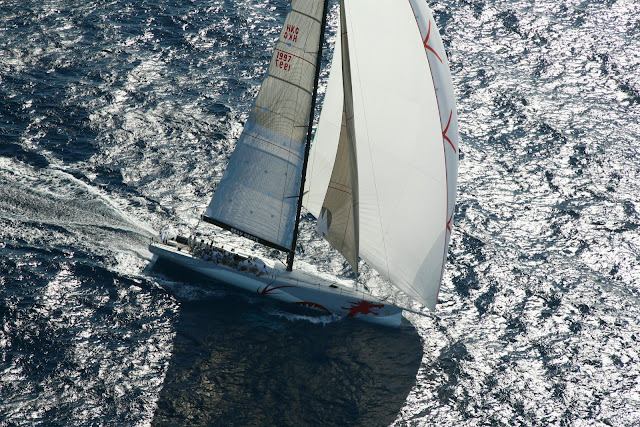 As Skandia Wild Thing, lost her keel in the 2007 race. Last year an issue with paperwork left her high and dry just hours before the race south. 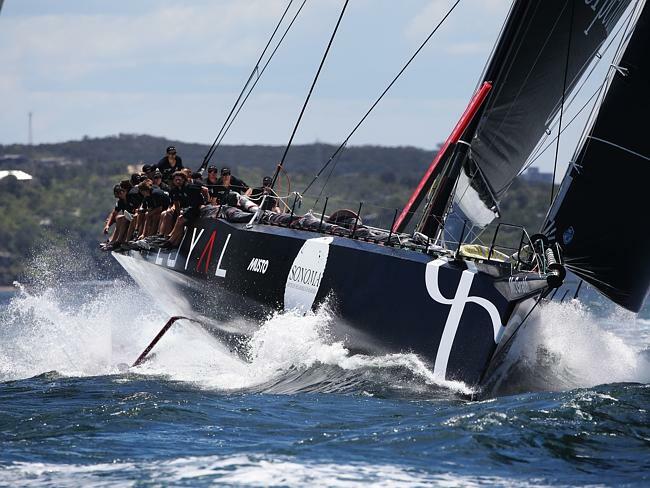 Midnight Rambler: A Sydney yacht which has been making a big impression in the lead up to the Sydney to Hobart. Sailed by a proven team headed by Ed Psaltis. Traditionally good in the wind, a new set of sails has also made her formidable in the light. Patrice: The new 46-footer from experienced skipper Tony Kirby, but untested in the Sydney to Hobart. Has tasted success in numerous lead-up races to the race south this year. Has an excellent crew on-board which also includes Gail Harland, one of the most experienced female sailors in the Sydney to Hobart with 18 races under her belt. Wild Thing: If it's a big-boat race, this is likely to be the 100-footer to beat. Recently claimed the overall honours in a lead-up race and rates better than her fellow supermaxis. Wild Oats has twice won the race overall and Wild Thing could be the next big boat to claim the coveted overall honours. 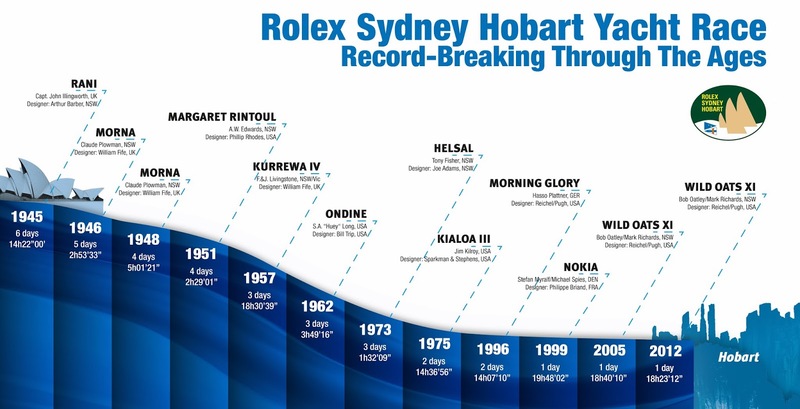 Wild Rose: Skipper Rogers Hickman has done more than 35 Sydney to Hobart races and is a former overall winner. This 43-footer is a former member of Bob Oatley's (owner of Wild Oats) stable and will be very well campaigned to Hobart. Regularly features on the podium in offshore racing. Beau Geste: The foreign raider. Sight unseen in Australian waters but still boasting a fearsome reputation. She will be campaigned by an excellent crew, including several America's Cup sailors from New Zealand. Brand new and boasting all the new gadgets and technology. Belharra décembre 2013 Jali Films / Pix & Fly from Pix n' Fly. It was on a platform of the Paris Metro that Michel Desjoyeaux realized he finally had to snap out of it. He was just back from nearly 100 days sailing around the globe with no sighting of another human being, his only contact to the outside world a satellite phone. His body was, in essence, still on red alert for any obstacle in his midst. "Waiting for the train, a guy was in the way of the doors and I just yanked him out of the way," recalls the 48-year-old, who just days earlier had returned to France victorious from the grueling Vendee Globe race. "I was still in that mindset of not letting anything get in my way. It was unhealthy. It was then I said to myself, 'Michel, the race is over now.' But it's hard as solo racing just takes over your body and mind." It is 45 years since British yachtsman Robin Knox-Johnston became the first man to perform a singlehanded, nonstop circumnavigation of the globe, achieving the feat in 312 days. He was the only person to finish of the eight-man field in the Golden Globe Race, during which one competitor Donald Crowhurst died -- having committed suicide after attempting to fake the details of his own round-the-world attempt. So what makes someone decide to take on such a daunting challenge? To spend months away from family and friends, coping on a mere four hours of sleep a night -- most of that broken -- while tackling monster waves on the world's most challenging waters? For Knox-Johnston, also the oldest person to sail around the planet solo, aged 68 back in 2007, the lure of such a perilous challenge is obvious. "It's what I do -- I do the sea," he says unapologetically. "To people it may seem dangerous, foolish even but, for me, it's not a strange environment. It's not alien to me, it's where I'm happiest. "As for circumnavigating the globe that first time, I didn't want to get to 90 years old and think what I could have done. It was dangerous, particularly as no-one had done it before, so you couldn't read up on it, and frequently you feel in danger. Having 27 meters crashing down on your boat will make you feel that way." Back in 1968, there was none of the communications enjoyed by today's sailors, requiring instinct more than anything else. So how did Knox-Johnston's voyage compare nearly four decades on? Sir William Robert Patrick "Robin" Knox-Johnston, CBE, RD and bar (born 17 March 1939) is an English sailor. He was the first man to perform a single-handed non-stop circumnavigation of the globe and was the second winner of the Jules Verne Trophy (together with Sir Peter Blake). In 2006 he became at 67 the oldest yachtsman to complete a round the world solo voyage in the VELUX 5 Oceans Race. "You realize that round-the-world sailing is a young man's game," he says. Desjoyeaux is one of the best modern-day exponents of solo sailing -- the only two-time winner of the prestigious Vendee Globe, in 2001 and 2009 -- and he was born into the sailing fraternity. His father, who served in the Resistance during World War Two, founded Glenans Sailing School -- which teaches 15,000 trainees each year. Nicknamed "The Professor," Desjoyeaux is more than just a sailor, he is also an innovator. He writes software for the auto-pilot systems used by many sailors, and has also been integral in developing boating equipment, including the introduction of a sideways-swinging keel 11 years ago. Despite his wide-ranging proficiency, he is no stranger to adversity on the open seas. Just last month, his yacht dismasted while leading the two-handed Trans-Atlantic race from Le Havre in France to Itajai in Brazil, just 140 miles (260 kilometers) from the finishing line. Speaking by satellite phone to CNN just hours before that moment on board his vessel MACIF, he explained why he first set out on the solo voyages. "First, your life is too short to do something you don't want to do," he says. "Second, you will not be efficient because you don't want to do it, and third the most important one is if you don't want to do it then you will make mistakes and then not be efficient. "In safety terms, that's when things go wrong. Before anything else, you have to want to do it, otherwise that's it, no point." Desjoyeaux says the all-consuming nature of the racing ("24 hours of the day, you're just trying to optimize everything") means it is a completely different way of life, hence his personal struggles to get back into everyday norms on land. He says the Vendee Globe, a three-month ordeal held every four years, is "the most complete and perfect race you can imagine. "So when I finished the first time, I was sure I'd come back - it was still something I wanted to do." It is common to see sharks and dolphins in the water, as well as whales -- although the large mammals are to be avoided at all costs because of the damage they can do to a vessel, which is often battling treacherous seas. "I don't think there is too much danger as safety on the boat is always No. 1," says Desjoyeaux. "I don't take too many risks. If it's dangerous, I slow down and do it properly. I want to keep my life." Traveling around the world in a vessel is not just about being a master sailor, a tactician or mentally strong. It is also about being a businessman and raising the funds required to get such an expedition off the ground. Budgets for the 2008-9 Vendee Globe were around €10 million ($13.8 million) for the very top boats, each of the leading boats costing about €3.5 million ($4.8 million). Such numbers makes British racer Steve White's achievement at that race all the more impressive. He arrived on the start line not knowing if he even had enough funds to compete. Under competition rules, all boats taking part having to be in the harbor at Les Sables-d'Olonne three weeks before the start date. Just to get to that point, he had remortgaged his and his wife's house four times in order to buy the boat on which he aimed to compete. He had two weeks in which to raise £200,000 ($328,000) to fund the trip, a big sum but small fry in global sailing terms. "I had this green energy company all set to sponsor me to the tune of £100,000, as well as another businessman to another £100,000," he recalls. "The green energy company were on board, they just needed things to be signed off in one final meeting. But then they went quiet and finally I got word that they weren't going ahead. "So I went back to the guy (the businessman, who to this day has asked to remain nameless) and said I couldn't match his £100,000 so I didn't expect him to fulfill his side of the bargain. So I thought I'd have to face the embarrassment of sailing away before the start in front of everyone. "When I finally spoke to her, it transpired this guy had stumped up the entire money. In a flash, I'd gone from suicidal to being in tears. He'd essentially sorted me out for the rest of my life by enabling me to do this." In the end, the trip cost £245,000, which White part-funded by being paid his €20,000 prize money for finishing eighth in advance. But it was a race against the clock just to get ready, as he and his team worked through the night to get the boat prepared. By the time he set off for his 109 days at sea, he was already shattered. Almost immediately, terrible weather hit in the Bay of Biscay, breaking up the much more expensive boats of his rivals. In all, just 11 of the 30-strong fleet finished. "I enjoy being alone at sea, and in a weird sort of way love testing myself and seeing if I pass the test," White says. "But it's an odd test. As something breaks, you're like 'good grief' and it feels like torture. But then a moment later the weather changes, as quickly as your mood, dolphins are jumping in front of the boat and there's the most amazing sun -- it's just a very serene, meditative experience." White is not done with solo sailing. His next challenge is another solo nonstop circumnavigation, but this time the wrong way -- against the prevailing winds and currents -- before returning for another shot at the Vendee Globe in 2016. For White, the appeal of such journeys is hard to explain. "I remember (fellow sailor) Mike Golding saying, 'You can't really understand it if you've not done it.' I didn't really get that until I did it. Unless you do, you won't either." The record for a solo nonstop circumnavigation is a formidable 57 days, 13 hours and 34 minutes set by Francis Joyon in 2008 -- the fastest Vendee Globe completion, by comparison, was at the 2012-13 staging when Francois Gabart came home in 78 days, two hours and 16 minutes. Yet another Frenchman, Thomas Coville, is now seeking to beat Joyon's milestone -- having aborted his fourth attempt last month, he is back on the water trying again in his 31-meter maxi-trimaran. "It's a phenomenal record," says Knox-Johnston, "but Thomas is a very experienced sailor, and is certainly a guy capable of doing it. The target's tough right now but that's the joy of records -- they're there to be broken." If he does so, what next for Coville and the rest of the world's solo sailors? If you have to ask, it would seem, you clearly don't understand. It is a bizarre nightly ritual that is deeply embedded in the British way of life. "Viking, North Utsire, South Utsire, Forties, Cromarty, Forth, Tyne, Dogger ...." says the voice. The BBC's beloved Shipping Forecast bulletin covers 31 sea areas, the names of which have inspired poets, artists and singers and become embedded into the national psyche. Somewhere, deep in your memory, stir echoes of British history — of invasions from across the sea by Vikings, Romans and Normans; of battles with Napoleon's galleons and Hitler's U-boats. Finally, as the BBCs Shipping Forecast bulletin draws to a close, you nod off, complacent in the knowledge that whatever storms are blasting away on the oceans out there, you're in your pajamas, sensibly tucked up at home. The fact that you know nothing much about the sea, and cannot tell a freighter from a futtock (part of a wooden hull), is beside the point. For you, listening to the BBC's Shipping Forecast every night is about something else entirely. You're paying homage to an institution that is as much part of the jigsaw that makes up Britain's national culture as drizzle and warm beer. 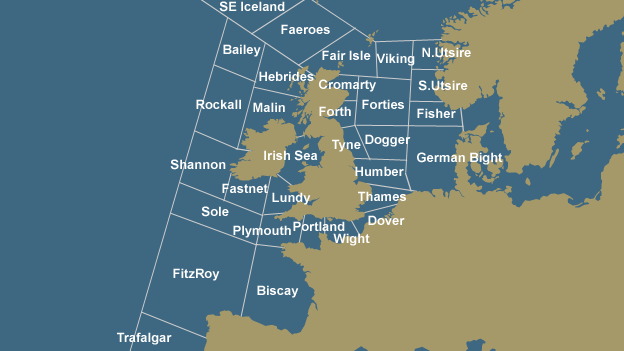 Why does the Shipping Forecast mean so much to so many in the U.K.? For one, the weather still actually matters for many coastal communities, such as the tiny island of Lundy off the Southwest of England, home to 28 people. There's the Tyne in the Northeast — one of the 31 sea areas that feature in the forecast — once a maritime hub for Britain's mighty coal and shipbuilding industries where the "Geordies" are now striving to find a new role for their community. And in the ancient southern seaside town of Hastings, the same families have been fishing for centuries. This is "Sailing By" composed by Ronald Binge in 1963, and performed by the Alan Perry/William Gardner Orchestra, and is the version used by the BBC for its late night shipping forecast. Sailing By is played every night on BBC Radio 4 at around 00:45hrs before the late Shipping Forecast. Its tune is repetitive, assisting in its role of serving as a signal for sailors tuning in to be able to easily identify the radio station. It also functions as a buffer — depending on when the final programme before closedown finishes, Sailing By (or part of it) is played as a 'filler' as the shipping forecast starts at 00:48hrs precisely. But for many Britons, the Shipping Forecast is much more significant than a weather bulletin for the fishermen and sailors who make their living from the oceans. A very large number of regular listeners are landlubbers. They are, however, fiercely loyal. BBC Radio 4 broadcasts the Shipping Forecast four times a day, but the late-night bulletin — shortly before 1 a.m. — possesses a particular mystique. It's not uncommon for listeners to ask for the music that introduces it — "Sailing By" — to be played at their funerals. A few years back, when someone suggested changing the bulletin's timing by just 12 minutes, there were angry speeches in Parliament and indignant newspaper editorials. Listeners brandishing banners demonstrated outside the BBC's London headquarters. The idea was eventually abandoned. Exactly why the Shipping Forecast is held in such affectionate esteem by the British public is a topic of considerable discussion in the U.K. Many people compare the forecast with listening to poetry. There is a natural rhythm to it," she says, "just like the sea." This may help explain why the Shipping Forecast has enthused so many artists over the years. It has inspired poetry by neighboring Ireland's late, great Seamus Heaney and also Britain's Poet Laureate Carol Anne Duffy. It arises in art; it's referenced in TV shows, movies and songs — such as Blur's "This is a Low," and Thomas Dolby's "Windpower," which actually ends with a sample from a broadcast. A snippet from the bulletin cropped up in Danny Boyle's widely acclaimed opening ceremony of the 2012 London Olympics. Comedians aplenty have tried their hands at parodies of the forecast. Peter Jefferson presented the Shipping Forecast on the BBC's airwaves for 40 years. In his book And Now The Shipping Forecast, Jefferson offers this explanation: "There is something in many of us that likes the certainties of life and is averse to change. "The Shipping Forecast is a comfort, a given, a sign that maybe, just maybe, everything is alright with the world after all — until the next day dawns, anyway — but that's a few hours of delicious sleep away! Time for the febrile mind to repair itself, rest, chill out, relax and take gentle stock of things."